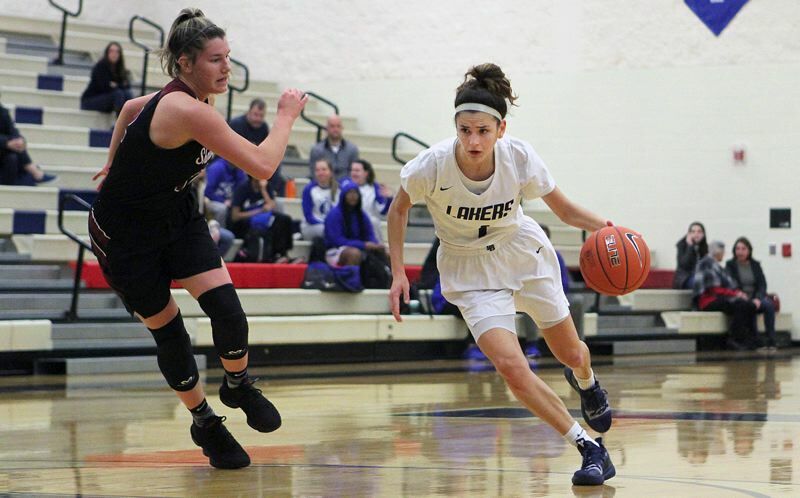 The Lake Oswego girls basketball team has already learned a lot and improved a lot in the new 2018-19 season. But there are more gains to be had as the Lakers learned during the 2018 Nike Interstate Shootout. Lake Oswego — competing against 15 other teams in the Shootout at Lake Oswego High School from Dec. 26-29 — went 1-3 in its four games, winning its first contest and then dropping the final three. "At the end of the day, we just need to work our hardest because there's not one or two good girls (on other teams), every girl is going to get their buckets so we just have to work on lockdown defense against everybody," said Lake Oswego senior guard Taylor Anders. "And once we get on offense, it's about sharing the ball and getting the best look." "I think there is a lot of work to be done and our mentality needs to improve as well," said senior guard Katy Gilbert. "I don't think we're always mentally prepared to play so I think there's a lot to be done before league play. I'm definitely optimistic about it, and I hope the rest of the girls are as committed as I am." The Lakers opened the tournament with a 63-43 win over Milwaukie on Dec. 26, fell to Grants Pass 62-36 on Dec. 27, dropped a 56-30 decision to Sherwood on Dec. 28, and fell to crosstown rival Lakeridge 57-35 in their Dec. 29 finale. With those results, the Lakers saw their overall season record fall to 3-8. The Lakers, hosting Milwaukie in the first round of the Shootout, started their game at a dead sprint, racked up a 17-point lead in the first quarter and rolled home to win from there. "Something we're working on a lot is higher percentage shots, so not the first or second look, but the third or fourth," said Anders, who led her team with 18 points. "So we're working on ball movement and getting shots that are closer in and stuff like that." The Lakers were tough as nails at the start of their contest against the Mustangs, forcing 10 first-quarter turnovers and turning those Milwaukie miscues into 10 points at the other end. LO opened the game on a 10-0 run highlighted by Woolard's 3-pointer, and after Milwaukie's first basket, the Lakers scored another nine straight to lead 19-2 with 1 minute, 3 seconds left in the period. By the end of the quarter, Gilbert had five points, Anders four, and freshman Kate Anders and Woolard three each. Milwaukie — led by Cali Denson's game-high 24 points — got its offense into gear after that, outscored the Lakers 11-9 in the second quarter and closed within 28-13 at the half. But the Lakers made sure the Mustangs got no closer, outscoring Milwaukie 15-11 in the third quarter to push its lead to 43-24. Denson went off in the fourth quarter with four 3-pointers and 14 points, but it was too little, too late. Gilbert added 13 points in the win for Lake Oswego and Ruttert eight. Facing Grants Pass on the second day of the Shootout, Lake Oswego got off to a slow offensive start — the Lakers managed just 14 points in the first half — and the Lady Cavers made them pay. Grants Pass sent four players into double figures, led by Grace Gaither's game-high 18 points and 12 each from Ayla Klingler, Elizabeth Williams and Ahdra Klingler, took a double-digit lead into the half and built on it from there. Lake Oswego was led by sophomore Emma Jeanson's 11 points (including three 3-pointers) while Gilbert added 10 (all in the third quarter) and Woolard seven. Gaither was particularly tough in the second quarter, knocking down two "3s" and scoring 11 of her 18, while Ayla Klingler racked up seven of her 12 in the fourth quarter. Sherwood made life miserable on the tournament's third day, too, racing out to a 23-8 lead after the first quarter and using that fast start to set up their eventual victory. The Lakers actually held their own in the second and fourth quarters — they were outscored just 18-16 in those two periods — but saw the Lady Bowmen's success in the first and third frames seal their fate. "I think our main problem was we just had too many turnovers," Ruttert said. "We weren't calm with the ball, we kept panicking and we didn't look across on the weak side because lots of times when we drove, the weak side was open, so if we start looking to the weak side and hitting other people for open shots, I think it will be better." "I think offensively, we just panicked a lot under pressure, especially with their press which is really strong and has been strong for a lot of years," Gilbert said. "We just need to be confident in our ability to be strong with the ball, and defensively, our communication just needs to increase a lot because we're not talking to each other and that's when we're getting stuck on those screens and stuff like that." After trailing 34-17 at halftime, Lake Oswego saw Sherwood pull away again with a 15-6 scoring advantage in the third period to extend its edge to a commanding 49-23margin. For the game, Gilbert led Lake Oswego with nine points, Ruttert added eight more and Anders had six. For Sherwood, Aubrie Emmons led the way with 17 points, Kaytlin Cooke added another 11 and Kylah Williams had nine. That set up a Day 4 matchup against crosstown rival Lakeridge, and the Pacers proved they were ready. Lakeridge senior guard Brooke Clinton was hot early, scoring seven points in the first quarter and 11 in the half on her way to a team-high 15, while freshman guard Reese Ericson and sophomore guard Addie Reardon both hit first-quarter 3-pointers. Anders and Gilbert tried to keep the Lakers close with four points each in the first, but on this day, it just wasn't enough. For the game, Ericson added 14 in the win and Daniels seven. For Lake Oswego, Woolard knocked down two "3s" and scored seven points in the third quarter, while Gilbert broke free for a huge fourth period, draining three 3-pointers and scoring 11 of her game-high 17 points.